We often say that if we want to truly understand outcomes for people, we need to bring the numbers and data together with their stories – but are any of us managing to do this? This session will look into new ways of demonstrating performance in an outcomes world using appreciative inquiry techniques to look at the experience of participants, helping us to glimpse a different “outcomes performance” future, and igniting participants first steps towards it. Do you have any ‘dangerous ideas’ around what do you think would really make a difference to Scottish Government? As part of the Fire Starters Festival, we are hosting an open networking event for all those interested in igniting change. Participants will be given a chance to ‘burn’ things that they want to leave behind, and spark ideas for the future of Scottish Government with one another. Each drop in session will run for one hour, and will be available all afternoon. 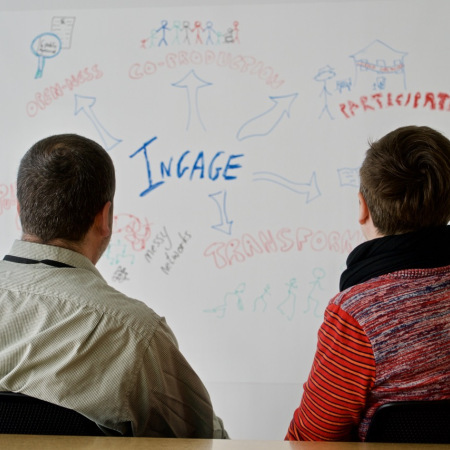 U.lab has sparked off a creative and inspiring journey for many change makers in Scotland. Here we offer a day of exploration and discovery around the U.lab experience and consider what next? Opportunities to share prototyping from sparks to wildfire, and tap into a range of expertise from the U.Lab community and beyond. Stories play a big part in how we make sense of our lives, our organisations, our world. They carry and shape our values; can limit or transform organisational cultures; and often shape political agendas. Yet many of us tend not to look that closely at the stories we tell, rehearse, ignore, or develop as acts of leadership. In this workshop we will look at different theory and practice to discover how storytelling can be a transformative practice for anyone involved in public services – no matter how senior or in what organisation. Places are limited to 30 so sign up early to guarantee your place.